Bonded dogs are some of the hardest to adopt cases and when they’re senior bonded dogs like these two it’s even harder to get them adopted. So we really, really need all hands and paws on deck. PLEASE SHARE. They are located in Tuscon Arizona! These two dogs are simply beautiful inside and out, we really want to see them adopted into a good home and soon to live out their senior years! These two brothers-at-heart, Boomer and Will Sniff, have been swirling around the Internet for some time now, yet still they haven’t stood out enough to find a home. They are EXTREMELY bonded. Both boys are currently waiting at the city shelter wondering when (or worse, IF) their time will come. Boomer is an 11 year old tricolor Siberian husky mix and Will Sniff is an 8 year old German Shepherd / Welsh Corgi mix. The shelter staff and volunteers have been desperately trying to find them a home together because breaking them up would truly be devastating. Shelters cannot handle the animal overpopulation problem without the help of the community. We really need your help, so again we ask that if you cannot adopt to please share this post. 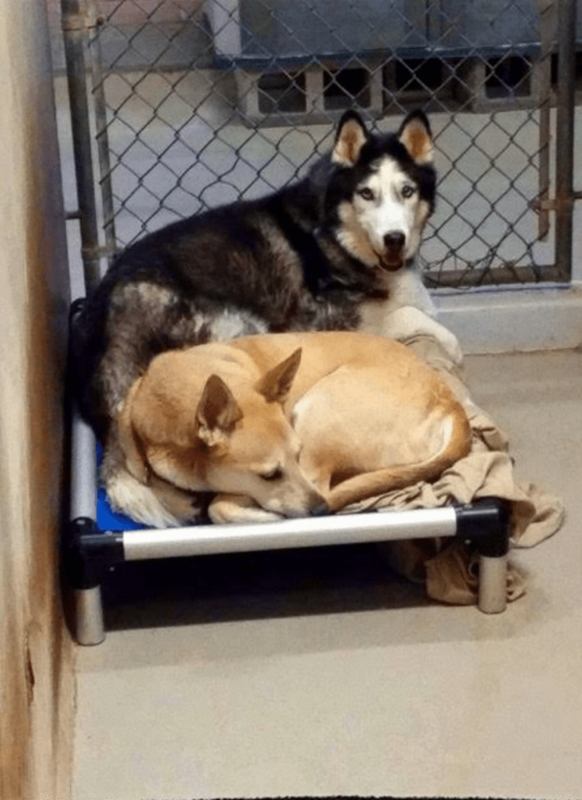 A shelter volunteer wrote, “Perhaps even more emotionally challenging than seeing a senior animal in a kennel is seeing a senior bonded pair. And the bonded pairs stay around longer, for obvious reasons. You only pray they’ll eventually make it out. And together. And that brings us to Boomer (the Husky) and his buddy Will Sniff. These guys came in together as a confiscation because their owner died. And they are as close as can be. Boomer is an 11-year-old Husky. Will Sniff is an 8-year-old Shepherd-Corgi mix. They are extremely bonded, though Will Sniff is far more active, especially if he’s with people. Boomer’s hip may be bothering him but we don’t really know. Please Contact Prima Animal Care for more information on adopting Boomer and Will Sniff. Aww….so many precious animals need homes. I so wish I had more room. I’d take in more for sure. I am getting so emotional reading this review after losing my 16 1/2 year old best buddy dog in October!! I find it hard to believe that someone gives up a dog just because they get old?? Should we throw away senior citizens because they are old?? I didn’t leave my doggie’s side, as a matter of fact, I did NOT want to leave him!! They are beautiful!! I really hope they have a nice Christmas getting adopted together!! My Pug was a puppymill survivor Senior and no one wanted her. 4 families brought her back. I spend everyday with her and she is the most lovable pet I have ever had. They just need someone to show them love and time. Let them live out the rest of their lives in peace and with love. Glad they have each other, some are on that cot alone and depressed. Thanks for sharing the pups needing homes. I hope they get the best present(adopted) of the year. Would love to take both. I hope they find their furever home very soon! Beautiful babies! I hope and pray these sweet boys find their furever home very soon! These dogs are beautiful, I do hope and pray that they get a good wonderful family soon, I wish I could take them but not my place to do so..
People have to remember not to rush out and get an animal for a holiday present. Unless, they have totally thought about it. Once, my ex came home with two puppies for the kids. I wasn’t expecting it and had two very young children to take care of. The puppies had worms and it was an awful mess. Both of them are so cute. I hope someone in Tuscon Arizona adopts both of them together. A heart breaking story, they are both so beautiful but because they live in the shelter they have that horrible sad, defeated look in their eyes. I pray they will find their forever home very soon and live out the rest of their life in a happy, warm home together. It’s such a sad word we live in where so many of these precious babies don’t have a furever home!!! Hopefully someone will see this and adopt these 2 sweeties. Everyone can use a little extra love. I hope they find a home for Christmas. They look cute together. Very nice. Oh my goodness, beautiful dogs!! They shouldn’t have trouble finding homes! I hope these sweet babies get a wonderful home soon! I wish I could adopt them. They are so cute. I hope someone is able to get them, they look like greeat dogs. I do hope that they can be adopted together. They both look attractive and it is not their fault that their owner died. I so hope they get adopted and find a wonderful home where they can be together.